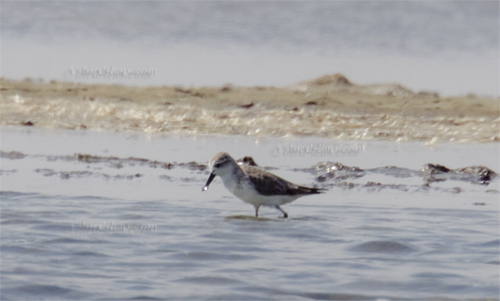 But the best place on finding Spoon-billed Sandpipers in Thailand is certainly at Pak Thale, on the north-western coast. As already mentioned with many other birders, it proved to be very important to get at Pak Thale early in the morning as the birds seemed to be consistent early morning visitors to their favorite ponds. At Pak Thale I went straight to the most reliable pond which was located near a wooden hut with a water pump (approx. 300 meters west of pond 2 on the Sibley´s Google map). Every morning there were at least two individuals in this pond. The favored ponds of the birds change with water levels from day to day, and water levels are controlled by the needs of the salt works, so it is necessary to check and assess the water levels in the ponds each morning. Try to be there just after 6:00 am. Also, in the early morning, the lighting from the east favors the viewing from the tracks between the saltpans. Normally wind picks up during the day, thus the morning gives you the chance that the wind is lighter. On the first day there were a strong onshore wind. This might keep the water high so that the extensive mudflats on the Gulf of Thailand are not exposed and the birds have to stay in the high tide roosts in the salt ponds. Another argument for the early morning is, that temperatures are cooler anyway. If you are lucky, the tide is high in the morning and you will have great fun – not only with the Spoon-billed Sandpiper. I took accommodation at the Whitebeach Resort which is located only 3 minutes away from the “Derelict Building” –site along the beachfront on Chao Samran Beach. The White Beach Resort offered reasonable prices in combination with nice sea or garden views, air-conditioned rooms and a daily breakfast. To cope with the growing demand for top shots of the rarer species of the Palearctic Bird-Lens is keen to enrich the range of pictures of birds you can find in the western palearctic. Trips to remote places but also to tourist spots like Thailand to capture images of rare birds of western palearctic were very successful. The nice images you find in the gallery are only a first impression, what you will find in the gallery in the “Pictures Shop” very soon. Just give me a message, if Bird-lens could serve you with an image needed before the new pictures are online.